Produced under excellent workmanship, this rubber has an outstanding molecular structure, leading into more ductility and elasticity. 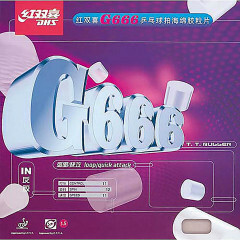 Moreover, the G666 offers the typical "Chinese-sticky" surface, keeping this character at long sight. The special elasticity of the sponge ensures an optimal moment of friction when hitting the ball and therefore improve the player's ability of controlling spin and placing of the ball effectively. This new sticky rubber has been extensively developed using the latest sponge and rubber technologies. Used by world-class player `Wang Hao`. His aggressive looping over the table and forceful attack benefits most from the extended control qualities. DHS Rubber G 666 is beeing added to cart.